Carpet beetles are classified as dermestid beetles, generally associated with infesting wool fabrics, furs, hides and leathers, and other natural animal-based products. They can infest a home any time of year but typically are more prone to be seen during warmer months. In addition to animal-based products, carpet beetles can infest food products such as cereals (including cereal-based dry pet foods), corn and rye meal, red pepper and other spices. The greatest concern with carpet beetle infestations are in institutions such as museums or other facilities that house animal trophies or insect collections that can easily be damaged by these insects. 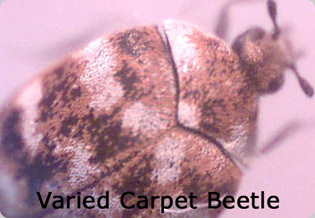 The two most common carpet beetles encountered in western Oregon are the black carpet beetle (Attagenus unicolor) and the slightly smaller varied carpet beetle (Anthrenus verbasci). Carpet beetles go through a complete metamorphosis in their life cycle (egg, pupa, larva, and adult). The larva of both beetles are light brown in color and look hairy when seen under a magnifying glass, with either long hairs toward the rear end of the black carpet beetle larva and shorter tufts on the rear end of the varied carpet beetle larva. Varied carpet beetle adults have mottled, calico-colored patterns of brown, black, and white on their dorsal side. The adult beetles will be attracted to light, especially windows, during the spring months. Corrective measures: Generally, carpet beetle infestations indicate a source point of infestation somewhere in the structure, whether it be an infested food product, woolen fabrics, natural fiber carpeting, etc. Carpet beetles will also feed off of bees’ nests (especially paper nests such as hornet and yellow jacket nests), bird nests, and dead rodent carcasses. Finding the source of the problem, if possible, is a key factor in control. In widespread infestations inside of a structure, additional control measures may also be necessary. Leupitz Pest Control can assist you in providing the appropriate means to control these unwanted pests.